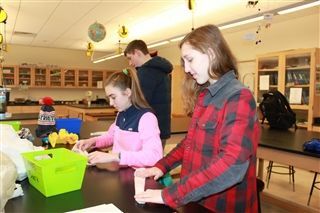 Upon entering Upper School Science teacher Tim Allerton’s classroom last Friday during personal learning block (PLB), you'd spy a transparent filmy hillock of plastic bags on one of the oversized lab tables. 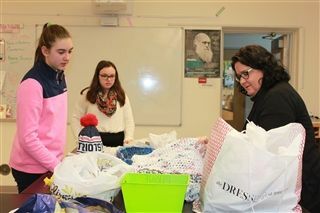 Stationed behind the bags was Allerton’s crafty wife, Wendy, who patiently taught the environmentally conscious Upper Schoolers, Maddie Arcaro ’21, Emma Henry ’21, Evan Banning ’21, CiCi Chagnon , and McKenzie Piehl ’19, how to crochet sturdy market bags from the excess of plastic bags that litter our homes on a daily basis. 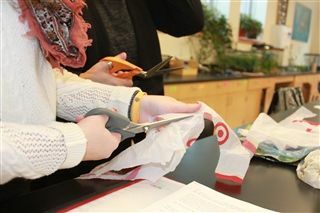 Allerton showed the students how to make the plastic “yarn” or “plarn” by cutting the plastic bags into long strips. First the bags are carefully flattened and rolled; next, the handles and bottom are trimmed and series of horizontal are cuts are made on the bag. In a tricky process involving cutting the bags on the diagonal, the segments are linked to make the longer strips measuring three feet. 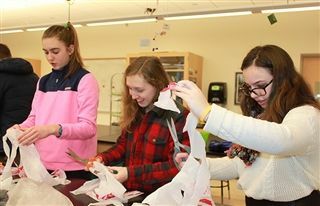 When students struggled using the scissors to cut the plastic bags into strips, Allerton, a skilled former educator, encouraged them with her positive comments, “Don’t worry when you cut them. Sometimes the more uneven cuts give the finished product a little more texture.” The final step involves crocheting the plastic strips into the market bags. “Plastics are the number one pollutant on earth. There are literal islands in the Pacific that are made entirely of plastic. Sea turtles ingest the plastic bags because they think that the bags are jellyfish, and that plastic ends up in their intestinal system,” said Tim Allerton. “The problem with plastics is that they break down into microplastic toxins. They will never degrade down into organic materials,” Henry continued. An avid proponent of environmental causes, Henry works at the Sea Adventure Camp in Jamestown during the summers where she produced eco-bricks made of plastic bottles stuffed with plastic bags to make a bench for a local elementary school. Surrounded by an assortment of plastic bags of blue, clear, yellow and white, the students methodically produced the “plarn,” looping the strands into one another. “Creating the yarn takes the longest amount of time - upwards of six hours,” Allerton said as she wound the plastic around her hands like a ball of wool. 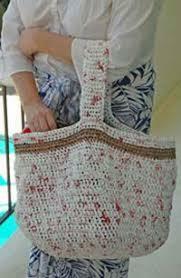 “You can crochet the actual bag in 30 minutes.” Allerton displayed a number of colorful totes composed of the bags; she favors a brilliant blue one crocheted entirely from discarded Hartford Courant wrappers. She estimates one market bag is the equivalent of 25 plastic grocery bags. Now that some retailers have banned plastic bags, including Big Y in 2020, these market bags will be in high demand. Start collecting or better yet, reduce your plastic usage, Wyverns, and start saving the planet one bag a time. A little goes a long way if we all do our part.